If you and your family are into baseball, don't miss your chance to get some Seattle Mariners baseball tickets for your next trip. I've been to baseball games on both coasts (and in between) and I have to admit that I really enjoy going to Seattle Mariners baseball games and it's a lot of fun taking my kids to games like my dad used to take me. The Seattle Mariners used to play at the Kingdome but in 1999 they moved to their current location at Safeco Field and it's a great park to watch a game in. 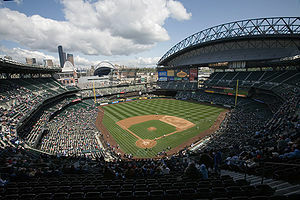 The stadium is located in the SoDo (South of Downtown) neighborhood in Seattle at the western end of Interstate 90. One thing that's interesting about the stadium is that it has a retractable roof that acts as sort of an umbrella, instead of a complete enclosure. The reason is because the weather in Seattle is usually pretty temperate but there is plenty of rainfall. I have a blast whenever I get a chance to go to the games and the last time I went I was able to go with my mother-in-law and we had a blast. We sat a few rows up behind home plate and were able to see all the action. I even think the Mariners won that game (which doesn't see to happen too often these days)! Parking is pretty easy if you use one of the parking areas around the stadium. This last time I went, I had a special parking pass for the garage near the stadium and after the game it took forever for us to get out and get home. We ended up just sitting in the car for about 45 minutes waiting for the cars to clear out because the traffic out of the garage was so bad. The one thing that bothers me about baseball now, though, is ticket prices can be outrageously expensive. I remember growing up and going to San Francisco Giants game in Candlestick Park and paying $2.50 for a left-field ticket. Long gone are those days. But even so, you can get decently-priced tickets to the Mariners games. You just have to start early and figure out which game you'll be going to so you can buy your tickets early. Here is a listing of Seattle Mariners tickets for sale. Back from Seattle Mariners baseball tickets.